Few people know how to remove skin tags - in fact, few people are usually aware that they actually have skin tags in the first place. Skin tags are small, soft and flesh-colored. These growths are typically found hanging from the skin's surface by a stalk, and they are generally easily moveable. They are commonly found in skin folds, on the neck, in the armpits and on the back and the abdomen. A mild cleanser. A gentle soap, like Dial or a liquid cleanser, like Cetaphil, is suitable. Sterilized forceps (easily found online or at medical supply stores). Carefully and gently grasp the apex of the skin tag with forceps. At a point level with the normal skin, cut the skin tag at its base. Apply consistent pressure to the skin to control bleeding. Bloodroot can be damaging to healthy tissue. Therefore, make sure you only apply it to those areas that need treating. Do not apply bloodroot if you are pregnant. Bloodroot is for external use only. Apply the bloodroot paste directly to the skin tag. Cover with a bandage, checking intermittently, until the skin tag has fallen off. Bloodroot paste can be purchased from alternative health stores such as Alpha Omega Labs or Lucky Vitamin. Cutting off the blood supply to the skin tag is one of the more common at-home methods used. In order to do this, simply tie a piece of string (a piece of dental floss is ideal) tightly around the base of the skin tag. After a few days, the skin tag will fall off on its own. 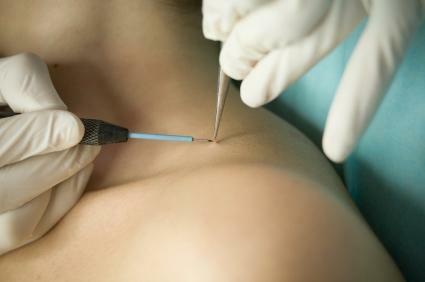 Cryosurgery: The skin tag is frozen off with liquid nitrogen. This procedure generally involves some pain, as the sensation of liquid nitrogen touching the skin is unnatural and exceptionally cold. Laser surgery: The cells of the skin tag are destroyed with a laser. As with cryosurgery, this procedure also involves some pain. Cutting: Cutting a skin tag off begins with a local anesthesia. Once the area is numb, the doctor slices the skin tag away and stops the blood flow to the tag. A doctor may use a scalpel or a pair of sharp surgical shears to remove the tag. Dermisil: The Dermisil W skin treatment is applied topically and is used for a wide variety of minor skin maladies. Skin tags are extremely common. They are found in women more than men, and their rate of occurrence seems to increase with age. Obese people are more susceptible to skin tags, possibly because of the increased likelihood of skin folds being rubbed together. A hereditary factor has also been cited in determining the likelihood of experiencing skin tags: if one or both of your parents have or had them, it is likely that you will, too. Skin tags may be a nuisance, but in most cases they are harmless. Doctors may recommend that a skin tag be surgically removed is if it is in highly vascular area that may bleed, and if the skin tag is growing and at risk for being accidently torn which would lead to bleeding and infection. Doctors may also suggest removal if they cause discomfort or pose a cosmetic problem (this is generally the case if the skin tag is especially visible). Regardless of which method is chosen to remove skin tags, watch the site carefully for signs of infection. If any appear, seek medical treatment.